Reporting in Salesforce is very powerful. And, if you are starting your reporting in Salesforce, it will be quite interesting. But, before you begin with Salesforce reporting, you need to have the basic knowledge of report types and its features. Below mentioned ones are few basics and useful information for reporting. You need to understand the business requirement to perform reporting in Salesforce. A small mistake in reporting leads in spending a lot of money and time consumption during the reporting process. So, before starting a report, understand the client requirement correctly and start the job. There can be several reasons for reporting from the client side. First, analyse the condition of the client and lead the client for proper output. There can be some extra features that the client is not aware of, so you need to provide the additional features included in Salesforce for the client output. We have different types of reports which provide ‘Simple Reports’, ‘Chart Based Reports’, ‘Grouping Based Reports’, ‘Multiple Grouping Based Reports’, ‘Block Based Reports,’ etc. How to Add Custom Tab in the "Tab Bar" ? What is a “Report” in Salesforce ? How To Create “Tabular Report"? How To Apply “Filters” In The Report ? How To Create “Summary Report"? How to add “Grouping on Country”? Tabular Report They are the simplest form of reports. They cannot be used to create groups of data or charts. They contain order set of fields in columns. They cannot be used to create summary. They are used to create lists of records. Rows are limited in dashboards. So, rows cannot be used. They are used to show a list with a single grand total. We cannot create charts on this report..
Summary Report They provide listing of data with groupings of rows and display of subtotals. It cannot show more than 1 dimensional grouping. They are used to display subtotals on value of particular field. They are used to create the chart. They are used to source dashboard components. 1. How to Add Custom Tab in the Tab Bar ? Customizing the Tab Bar For “Reports" & “Dashboards”. Login >> Click On the ‘+’ available on the Tab Bar. Click on the Orange colour “ Customize My Tabs ” button to the right top corner. Select “Reports” in “Available Tabs” and move to the “Selected Tabs” by clicking the “Add” button which is in the middle of both the Tabs. The same steps are repeated for “Dashboards” adding to “Selected Tabs” from “Available Tabs” area. Click on “Save Button”. The below figure shows the “Reports” and “Dashboards” Availability. What is a “Report” in Salesforce? A report displays a set of real-time data that matches certain criteria, which is useful for Salesforce Analytics. Let, us discuss in detail by assuming with an example. For the report analysis we require data in the object already created, i.e., “Naukri.com JobForms”. Note: Please create records sufficiently in the object for reporting purpose. Tabular Report: It displays simple list of records. Summary Report: It displays records up to 3 levels of grouping. Matrix Report: It displays records in 2 x 2 format, Similar to an “Excel Pivot Table “. Joined Report: It helps multiple business information to be seen in single report at the time as long as they have a common key. Click the “Reports” button in the Tab Bar. And, click On “New Report” button on the Tab Bar. We need to select from the “Report Type” to create a custom report of the Object. We can find the custom reports under “Other Reports” folder. Note: If you can not see the “Other Reports” folder, you need to get back to the “Object Edit” Page >> Scroll Down >> Under “Optional Features” >> Check the “Allow Reports” >> Save. This is shown in the below figure. Please select the “Naukri.com JobForms” >> Create. After “Create” >> Save the Report For Identification Purpose as “Naukri.com Tabular Report” >> “Save”. 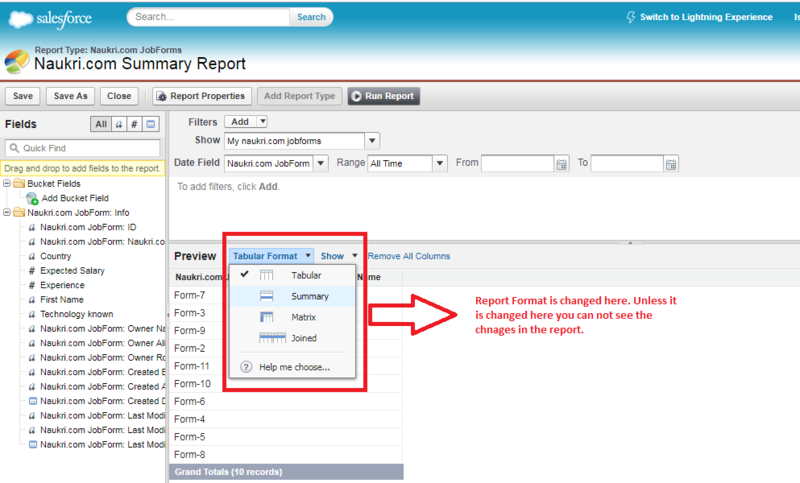 Note: The above page is called as “Report Builder” page where you can build and perform activities related to reports. From the above image, we can see how the name of the report done and from “Report Folder” >> always select “Unfiled Public Reports” >> Save. Note: Always select “Unfiled Public Reports” such that it is available for everyone. If you forget to check the box, the reports will only be visible to Admin. Without performing or customising the screen, just run the report. You can see the following report as mentioned in the figure below. If you want to customise the report with available fields, just drag and drop the available fields under “Naukri.com JobForm: ID” >> “Save” >> “Run Report”. 5. How To Apply “Filters” In The Report ? The below figure defines the “Naukri.com Tabular Report”. We can even customise our report by adding “Filters”. The Default filter in the Salesforce would be “Date Filter”. You can even customise the filters from “Add” Button at the top of the report page. By clicking the “Filter - Add” button, the filter will be available to customise for - Desired Field (First Name, Salary, Experience etc) and “Run Report”. Result: By applying the filter on “Expected Salary” less than or equal to “7777”. Below is the result figure. 6. How To Create “Summary Report"? Step1: Click the “Reports” button in the Tab Bar. Step2: Click On “New Report” button on the Tab Bar. After “Create” >> Save the Report For Identification Purpose as “Naukri.com Summary Report” >> “Save”. Need to change the report format in the preview as “Summary Format”, as shown in the below figure. As the previous “Tabular Report” activity, you can drag and drop the fields required for reporting in the “Summary Report” and “Save”. Note: The main difference between Tabular Report and Summary Report is the “Drop Zone” in Summary Report, which helps for grouping on specific field. Just drag and drop the field required on which grouping is required into the “Drop Zone” and >> Run Report. In the next topics, we will discuss in detail about “Add Chart To Summary, Matrix and Joined Reports in Salesforce" Keep following us for more info on Salesforce Administration.